Urbanisation is the process of shifting from rural inhabitation to urban inhabitation in a particular time and place where 70% of people live in secondary or tertiary (service) sectors. Cities are considered 'engines of inclusive economic growth'. Urban areas have both 'statutory towns' (municipal corporation, municipality, cantonment board or notified area committee), and 'census towns' with the criteria of minimum population of 5000 and 75% of male main workers engaged in non-agricultural activities, and population density of minimum 400 persons per sq km. According to the census of India 2011, our urban population is 37.7 crore (31.16%). Thus during 1901-2011, India's urban population increased by more than 20 percentage points. Historically, there has been almost three times growth since 1901 when India's urban population was only 10.8% of its total population. However, this proportion of urban population is far less than that in many developing and developed countries: viz. Japan (91.2%), Brazil (84.6%), UK (81.6%), US (80.9%), France (78.6%), Germany (74.5%), Russia (73.77%) and China (50.6%), as per World Bank and census data. Ten largest cities in India are Mumbai, Delhi, Kolkata, Chennai, Bengaluru, Hyderabad, Ahmedabad, Pune, Surat and Jaipur as per 2011 census of India. During 2001-2011, Delhi added 35 lakh more population (equivalent of Agra and Vishakhapatnam together), Bengaluru added 28 lakh more population (equivalent of Kanpur), Chennai added 20 lakh more population (equivalent of Patna), Mumbai added 20 lakh more population (equivalent of Kozhikode), Hyderabad added 19 lakh more population (equivalent of Thrissur), Surat added 18 lakh more population (equivalent of Vadodara), Ahmedabad added 14 lakh more population (equivalent of Varanasi), Pune added 13 lakh more population (equivalent of Srinagar), Kolkata added 8 lakh more population (equivalent of Warangal), and Jaipur added 7 lakh more population (equivalent of Dehradun). By 2030 India's urban population will reach 40.7%. Population growth in cities may be due to three factors : first, higher births in absolute number, second, lower mortality rate and third, migration from villages (rural to urban migration) or from small towns (urban to urban). In fact, given a fixed population size for a period in a specific city, there is less birth rate per year due to relatively less total fertility rate (TFR) of women due to their more and better education, prevalence of small family norm, more entertainment facilities in individual families, economic, spacial and social constraints in affording large family size, higher level of women's consciousness about health hazards involved in frequent pregnancies etc. Hence increase in size of cities is usually not substantially due to high birth rate, though total births in a city do have a bearing on the growth. Further, the facilities for health, especially reproductive health, are much more accessible, spread over and are better in quality both in public and private sectors, hence the infant mortality rate (IMR) Per thousand births, under five child mortality rate (CMR) Per thousand births as well as maternal mortality ratio per lakh births are much lower in urban areas than in rural areas - consequently there is a slight increase in population but this is balanced by a lesser birth rate also. However, migration (both from rural and other urban areas) contributes hugely in population growth in cities. Migration occurs usually due to both 'pull' and 'push' factors. Pull factors of cities include mainly the new and better opportunities for livelihood in both organised (public and private) and unorganised sectors, more and better opportunities for both school and higher education of children, more and better housing amenities, better cultural and entertainment facilities (cinema, clubs, theatres), more government offices and public utilities, growth of private sector, hub of political affairs giving more opportunities for political participation at different levels in various forms, more and better facilities for health and hygiene, more mass media sources giving opportunities for expression and participation, more freedom to the youth, more and better transportation and communication facilities etc. That is why the number of metros with ten lakhs plus population grew from 1 (Calcutta) in 1901 to 52 during 2011 - in 1951 it was 5, in 1961 it was 7, in 1971 it was 9, in 1981 it was 12, in 1991 it was 24, in 2001 it was 39 and in 2011 it was 52. Now, 6 cities in Maharashtra, 7 each in Kerala and UP, 4 each in MP, Gujarat and Tamil Nadu, 3 each in Jharkhand, Rajasthan and Andhra Pradesh, 2 each in West Bengal, Chhattisgarh and Punjab, and 1 each in Delhi, J&K, Haryana, Bihar and Karnataka have ten lakh plus population (2011). Ten fastest growing cities in India are Ghaziabad (23.8 lakh population), Durg-Bhilainagar (10.6), Vasai-Virar (12.2), Faridabad (14.1), Malappuram (17), Kannur (16.4), Surat (45.9), Bhopal (18.9), Aurangabad (Maharashtra 11.9) and Dhanbad (12) - annual growth rate ranging from 4.8% (Dhanbad) to 6.9% (Ghaziabad). On the other hand, push factors in villages are primarily : lack of livelihood opportunities (agriculture having underemployment or 'disguised employment' (as Gunnar Myrdal termed it), lack of educational and health facilities, lack of transportation and communication facilities, various restrictions on the basis of ascriptive bondages and regressive customs, especially on the women, lower castes and communities. In the last five-six decades it is also a trend that due to the problem of extremists and naxals in villages, many families have migrated en masse to urban centres in the same State or other developed State/or national capital. 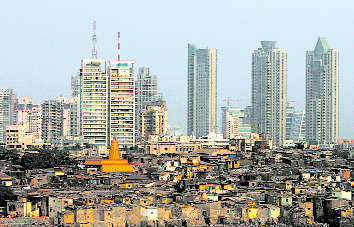 Urbanisation should also be seen in the proper context of India's economy. India is the second largest country (121 crore people as per 2011 census, now estimated to be about 130 crore in 2016) in terms of population in the world (sharing 17.5% of world population) next to China (138 crore population) India is the third largest economy (sharing 7.2% of world economy) after China (sharing 17.4% of world economy) and US (sharing 15.4% of world economy). In terms of GDP per capita, India has only 6.6 thousand dollars (PPP) against 57.2 thousand dollars in US, 48.2 thousand dollars in Australia, 47.5 thousand dollars in Germany, 46.2 thousand dollars in Canada, 42 thousand dollars in UK, 41.9 thousand dollars in France, 53.7 thousand dollars in Saudi Arabia, 38.7 thousand in Japan, 37.7 thousand in South Korea, 36.2 thousand dollars in Italy, 25.2 thousand dollars in Russia, 17.9 thousand dollars in Mexico, 15.2 thousand dollars in Brazil, 15.1 thousand dollars in China, 13.2 thousand dollars in South Africa, 11.6 thousand dollars in Indonesia! Thus, in HDI (human development index) ranking (2014), India ranks 130th - not only lowest among G-20 countries and BRICS, but also lower than many developing countries of the world. Paradoxically, Indian economy is growing at a fast rate of 7% per year, but the job increase is merely 1.1% annually based on 8 key sectors of non-farm economy as per Labour Bureau data (2016). Hence unemployment rate increased from 3.8% in 2011 to 5% in 2015. In 2016 total number of jobs created were 2.05 crores - 1 crore in manufacturing, 50 lakhs in education (low wages), 14.5 lakhs in trade, 12.1 lakhs in health (low wages), 10.4 lakhs in IT/BPO, 7.7 lakhs in accommodation/ restaurant, 5.8 lakh in transport, and 3.7 lakhs in construction sector. But IT boom is also facing challenges especially due to global slowdown, visa restriction and downsizing by the domestic IT sector. This has affected the urban middle class households in different ways. If we look at the Status of transportation and its consequences, we find that Delhi has the highest number of registered vehicles ( more than 1.05 crore on 25th May, 2017)- of these 66.49 lakhs are motorcycles/ scooters, 31.73 lakh cars and 7.46 lakh other vehicles (including 2.25 lakh goods carriers). There is a large number of high level of noise pollution and air pollution due to such vehicles. Delhi has been ranked by World Hearing Index as World's fifth noisiest city on the basis of only noise pollution but it is ranked second in the world in terms of both most noise and maximum hearing loss - Guangzhou (China) being the first. However, Delhi is ranked first in the 50 cities of the world where hearing was most degraded ( due to all reasons, including noise pollution). In Delhi, a person has hearing capacity of anybody at least twenty years older than he or she - that is 20% less than prevailing capacity in that age. There is a close positive relationship between urban noise pollution and hearing loss - (64%). To be more specific primary sources of noise pollution in large urban areas like Delhi in India are road traffic, aircraft, trains, constructions activities and industries. If we look at the air pollution, the situation is again grim in many Indian cities. As per State of Global Air 2017 report, long term exposure to fine particulate matter (PM2.5) contributed to 42 lakh premature deaths in 2015 in the whole world out of which India and China together shared 52% - 11.08 lakh deaths in China, 10.90 lakh deaths in India, 2.57 lakh deaths in E.U., 1.37 lakh deaths in Russia, 1.35 lakh deaths in Pakistan, 1.22 lakh deaths in Bangladesh, and 88400 deaths in U.S. Since 1990 premature deaths related to PM 2.5 have risen by 17.22% in China while in India it rose by 48% during the same period. As per Central Pollution Control Board report (August 2016), in 2015, 41 Indian Metros with 10 lakh plus population faced bad air quality in 60% of total days monitored. As per Greenpeace report 'Airpocalypse' study in 168 cities in 24 States and UTs revealed that, except a few cities in South India, most of Indian cities do not comply with WHO or National Ambient Air Quality Standards: against the standard limit of 60 microgram per cubic metre (PM 10) the top 20 cities in India have very high PM 10 levels between 268 and 168 (2015) - Delhi ranks first (268 microgram per cubic metre), followed by Ghaziabad (258), Allahabad (250), Bareilly (240), Faridabad (240), Jharia (228), Alwar (227), Ranchi (216), Kusunda, Jharkhand (214), Bastacola, Jharkhand (216), Kanpur (205) and Patna (200). Air pollution primarily leads to respiratory, cardiac and blood pressure problems, especially among the young and old ones. Vehicular exhaust, dust, open construction materials, garbage burning, 'parali' (crop residue) burning, especially in Punjab, Haryana and Western UP leading to smog in Delhi & NCR), fly ashes from brick kilns, haphazard demolition of old buildings, high emission from thermal plants, coal burning, use of fuelwood in some pockets, etc. lead to air pollution in most of Indian cities. In Delhi, vehicular emission contributes to more than 40% of air pollution there. During 2000-2016 in Delhi Sulphur Dioxide (SO2) has dropped from 15 micrograms to 7 micrograms per cubic metre during 2000-2016 due to use of cleaner fuel in vehicles and closure of thermal plants but, on the other hand, Nitrogen Dioxide (NO2) level has gone up from 36 micrograms to 65 micrograms per cubic metre during the same period. Due to increase in number of diesel vehicles - less than 10% of cars sold in Delhi were diesel engines in 2000 but now more than 50% are diesel engines - NO2 has increased. Hence there is a need to switch from diesel to petrol and CNG fuel. Further waste and biomass burning needs to be stopped to reduce NO2. Rising level of NO2 in air is causing ozone pollution badly. In BS-II Sulphur content was 500 PPM while in BS-III it is 100 PPM and BS-IV only 50 PPM. We celebrate every war World Water Day on 22 March more as a ritual than with a real action agenda. There is uneven distribution of water by regions, nations and sub-nations. For instance, Asia has 60% world's population but only 36% of global run-off while South America has only 6% of World's population but has 26% of global run-off. Similarly India, too, has 17.5% of global population but only 4% world's fresh water. One of the Millennium Development Goals was to reduce the proportion of people without access to safe drinking water by half by 2015 but we could not achieve this major goal. In urban India, we have water scarcity in different ways and proportions in different cities: e.g. in ten towns of Rajasthan water is supplied only once in three days! Further about one crore people in 35 cities in India are supplied 38% less water than the usual supply earlier. At the time of India's independence in 1947, there were about 800 ponds/ lakes in Delhi but most of these have been encroached upon and their nature has been changed due to construction of buildings, plain fields, roads and other public utilities. Further in four metros (Kolkata, Delhi, Chennai & Mumbai) 90 crore litres of dirty water is thrown out in rivers daily but only 30% is treated. So is the case of most of other cities in the country, especially in Kanpur, Allahabad, Varanasi, Lucknow, Patna, Bhagalpur etc. India has 433 billion cubic metre of groundwater and more than 80% of rural and urban domestic water needs in India is served by groundwater. But India's per capita water availability is declining sharply - from 6042 cubic metres in 1947 to 1545 cubic metres in 2011 and it is expected to further decline to 1340 cubic metres in 2015 and 1140 cubic metres in 2050. On the other hand, India conserves only 20% of its total rainwater while Israel scientifically conserves 80% of its total rain water! Water scarcity has often led to quarrels/ riots among common people in slums and undeveloped colonies where population density is very high but water taps/ tankers/ hand pumps available are quite less. Remedial Measures : Smart cities are being developed in India but its number is limited and already existing cities are being converted into smart cities. Hence there is a need to develop all urban centres. c)Odd-even formula of vehicles should be implemented with adequate preparation. o)Slums, shanty towns and so-called illegal colonies should be properly developed with clean drinking water, road, health, education, sewerage and other utilities on priority basis; only then the conception of 'smart cities' really materialise. Let us begin our efforts in an integrated manner 'here and now' as a thousand miles' journey begins with the first step.